This is one of those recipes that came out of opening the fridge and seeing what needed to be used up. There were these lovely chicken thighs and the remnants of a container of sour cream, just screaming to be combined. Here is the result! These chicken thighs are so moist and delicious! Once cooked they are also great eaten cold. Don’t expect deep fried flavour or texture here, but do expect amazing taste and the chicken to almost melt in your mouth. Line baking sheets with foil and spray with cooking spray. In a small bowl combine the bread crumbs and the spices. Arrange the chicken thighs on the foil. Brush with one half of the sour cream. Sprinkle with one half of the bread crumb mixture. 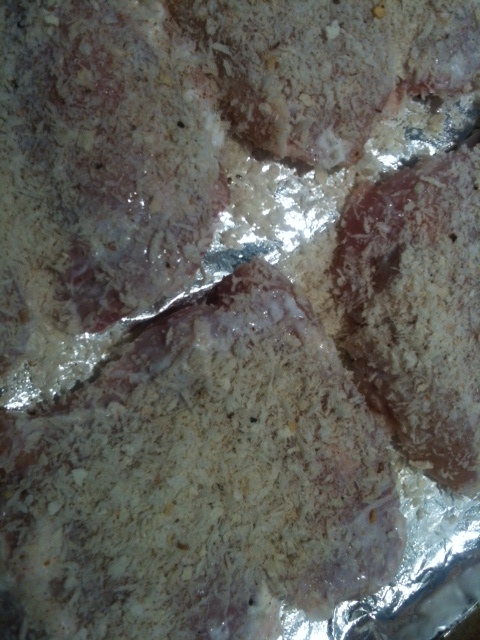 Pat the breadcrumbs into the chicken. Turn the chicken pieces over and repeat on the other side. Bake until the chicken is fully cooked. There are three of us, so we ate half and cooled the rest to put into the refrigerator or freezer. Note: They never did make it to the freezer, they were hoovered the next day. Yummy leftovers!